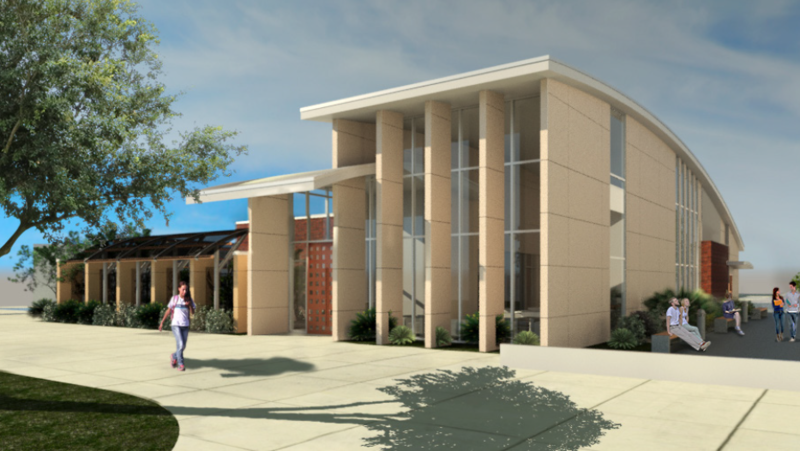 Illustration of the Veteran’s Center that will be located by the Forum and LA building and completed in 2020. also known as the Assessment Center, will get a facelift and interior upgrades which will be home to BC’s Veteran’s Center, funded by Measure J.
Bakersfield College (BC) will continue to roll out the next phase of plans for campus parking improvements, partial demolitions and construction beginning this month and continuing throughout the entire summer, while student traffic is light. The changes will continue into the fall semester where the modifications should be noticeable to retuning students. The goal is to complete the smaller projects to be followed by the continual introduction of larger, staggered construction projects over the next five to seven years. Thomas J. Burke, Kern Community College District’s Chancellor said that of the $503 million Measure J bond, BC was approved for $415 million. This will continually provide for the renovation, construction and remodeling projects which will modernize the buildings and grounds on campus. Bill Potter, Director of Maintenance and Operations at BC, is overseeing the planning and execution of the multi-million-dollar project. He said that this could take up to seven years to complete. As project phases are announced, students can expect some slight transitions and changes to the locations of services and classrooms, but first, the parking lots will be completed. However, one of the proposed parking lots in the renovation plans is a completely new addition to campus. According to Potter the plan to transform two soccer fields located on Haley into a 900-stall student parking lot won’t happen for four more years. When the final parking lot project is complete though, it will create a convenient access point at the entrance of campus for students and visitors. It will also be located on level-ground, which eliminates students having to walk uphill and affords a shorter walking distance to classrooms, according to Potter. Eventually the two soccer fields will be moved to the corner parking lot at Haley and University Avenue. This swap will add an additional 400 parking stalls on campus overall. This partial demolition will mean that half of the current center will be torn down and followed up by construction and remodeling phases over time. The new center calls for a three-story building construction and is projected to be completed by June 2021, at the cost of $30 million, according to the Facilities and Construction Group Monthly Report for BC released in March 2018. Illustration of what the $31 million-dollar the new Campus Center will look like once it is completed by June 2021. Most buildings on campus will get major renovations and internal upgrades over the next few years with the remodel conducted in a staggered fashion. When that renovation phase begins on buildings which house campus classrooms, the gymnasium will be used as a swing space to hold temporary classes. By staggering the renovation and remodel project, it allows construction crews to go through one building-at-a-time to improve them, and at the same time allow BC students to continue to get their educations without eliminating any courses. The fully executed construction, remodel, and renovation plans will be staggered out across several years, with a new gym built in the existing Physical Education building. BC’s current Science and Engineering building will be torn down and a new three-story building will be built. The demolition and construction project for the Science and Engineering building will begin next summer. The cost to build the 68,000 square foot space with modular labs, will be $65 million and is scheduled to be completed by the fall of 2021. Potter said that there is a need to construct newer spaces. The way that science and engineering are taught have changed since the buildings were originally built in 1954, “So, it’s cheaper to build a new building than to try to turn the 1954 lab into labs for this century,” he said. Other improvements will include campus-wide ceiling tile and flooring replacement. These improvements are scheduled to begin in the Language Arts and Center for Student Success this month and will completed in late December. Window coverings, phases II and III will also begin this month, and will be completed in December, according to the Facilities and Construction Group Monthly Report released in March 2018. Plans to relocate the Veteran’s Center will include a temporary move to a swing space in Levinson Hall located behind the campus bookstore. The new Veteran’s Center will be fully remodeled by 2020 and will be located in what is now known as the Assessment Center near the LA building and the Forum. 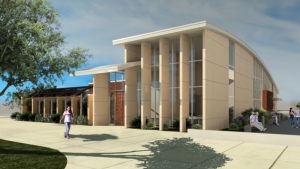 The Welcome Center will be located where the Admissions building currently sits and will be fully remodeled. 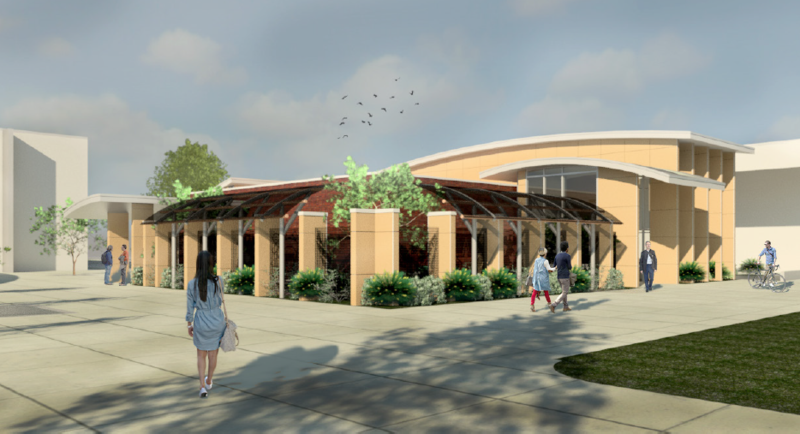 A new Welcome Center will allow students to take care of the admissions process, register for classes, pay for classes, apply for financial aid assistance and get help from Business Services. Illustration of what the new Veteran’s Center will look like once it is completed in 2020. BC has always been moving towards this. 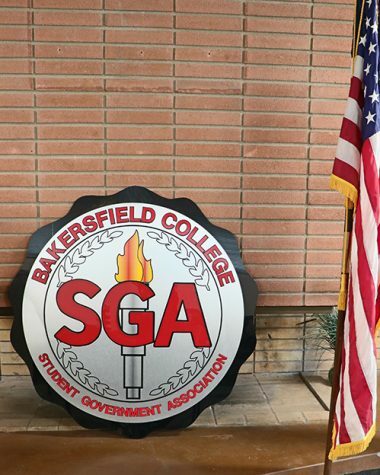 According to Scott, the Office of Student Life, the Bakersfield College Government Association (BCSGA), the BCSGA Conference Room, the Student Health and Wellness Center, the Panorama Grill, the cafeteria, and conference rooms would be housed in the CC, with the campus bookstore potentially moved to a corner location with its own storefront for more convenient access to books and supplies. Bakersfield College has had influence in Kern County for many generations, according to Scott. “It is one of the oldest continually operational community colleges in the country, so when we think of upgrading this campus to have state-of-the-art technology for here and now, for the students of the future, we are doing what we need to take care of our future generations. The benefits are that we are creating a better BC. We create the future workforce that stays in Bakersfield and stays local … the lasting impact that this campus has will span 50 years from now,” she said. The campus improvements project BC is committed to will provide students with the skills and education they need to enter the workforce and remain competitive as the college continues to grow. 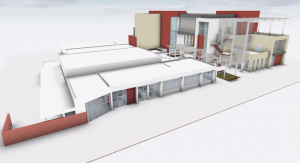 Once the projects are complete, there will be more parking space, more classroom space, more student support service space, with upgrades, improvements, and state-of-the-art technology equipment that will take BC and its students into the modern era.